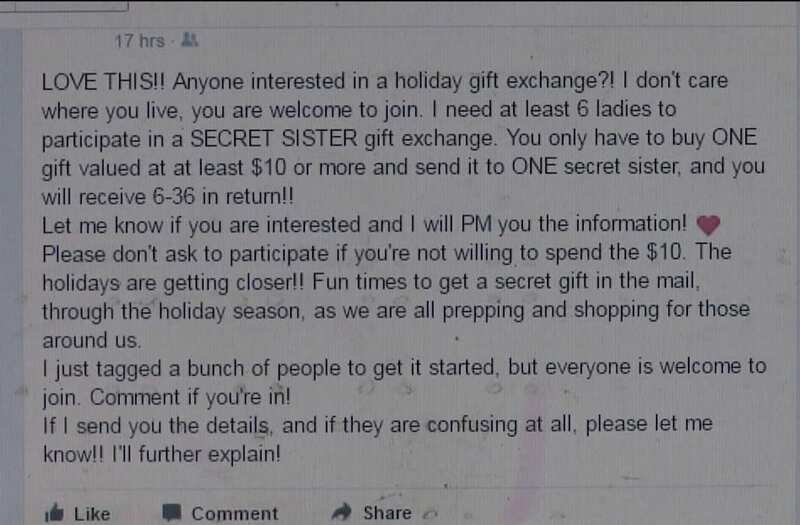 (WPIX) Now that the holiday season is here again, so is a familiar holiday scam. Police in Tennessee also posted a warning to their Facebook page this year. "There's at least one problem with chain letters. They're illegal if they request money or other items of value and promise a substantial return to the participants. Chain letters are a form of gambling, and sending them through the mail (or delivering them in person or by computer, but mailing money to participate) violates Title 18, United States Code, Section 1302, the Postal Lottery Statute. (Chain letters that ask for items of minor value, like picture postcards or recipes, may be mailed, since such items are not things of value within the meaning of the law."